For more than 50 years, legendary author Herman Wouk has dreamed of writing a novel about the life of Moses. Finally, at age 96, he has found an ingeniously witty way to tell the tale in The Lawgiver, a romantic and suspenseful epistolary novel about a group of people trying to make a movie about Moses in the present day. The story emerges from letters, memos, emails, journals, news articles, recorded talk, tweets, Skype transcripts, and text messages. At the center of The Lawgiver is Margo Solovei, a brilliant young writer-director who has rejected her rabbinical father’s strict Jewish upbringing to pursue a career in the arts. When an Australian multi-billionaire promises to finance a movie about Moses if the script meets certain standards, Margo does everything she can to land the job, including a reunion with her estranged first love, an influential lawyer with whom she still has unfinished business. Two other key characters in the novel are Herman Wouk himself and his wife of more than 60 years, Betty Sarah, who, almost against their will, find themselves entangled in the Moses movie when the Australian billionaire insists on Wouk’s stamp of approval. 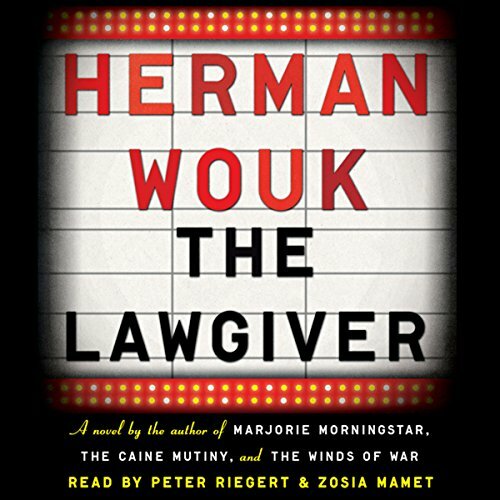 As Wouk and his characters contend with Moses and marriage, the force of tradition, rebellion, and reunion, The Lawgiver reflects the wisdom of a lifetime. Inspired by the great 19th-century novelists, one of America’s most beloved 20th-century authors has now written a remarkable 21st-century work of fiction. OMG, Herman Wouk is still brilliant at 97!! Would you consider the audio edition of The Lawgiver to be better than the print version? Yes. The narrators are perfect, and the text is written as snippets of emails, letters, journal entries, and conversatios, so that the story really lends itself to the audio format with a male and female narrator. What other book might you compare The Lawgiver to and why? Wouk is a genius at developing a female character (see Marjorie Morningstar and Natalie Jastrow), so any of his other novels stand up well with his latest. What about Peter Riegert and Zosia Mamet ’s performance did you like? Reigert makes one feel as if he is listening to Wouk himself, and Mamet does the women and each of them true justice. These are big female characters, and I had tears in my eyes after the epilogue. I'm a 64 year old man. i have a neice who is a rabbi, and I can't wat for her to experience this book. I would have to say Margo Solovei, as she seemed to be the most fleshed out. Oddly, off-screen character and uber-douchebag Smallweed is a runner-up, as the whole situation with him struck me as morbidly funny. Wouk also did a very good job writing himself as a self-insert. There were two narrators, a man and a woman. The male one was fine, the female one was bad - Margo sounded like a teenager reciting her diary. Also, if my memory is correct neither of them gave separate voices to the characters unless they had to - every epistle written by a male character had the same male voice, and second voices were only if the epistle contained dialogue. Did The Lawgiver inspire you to do anything? Not really. The Lawgiver isn't a weighty story: some light humor, some light romance, some light discussion of religion. All in all, a nice little story, if you're not expecting anything deep. What made the experience of listening to The Lawgiver the most enjoyable? This book is written in a very different format that other Wouk masterpieces - and it may take a bit of time to adjust to the approach - but it is clearly worth it. Who would have thought that a book could be written as a collection of emails, meeting transcripts etc - but Wouk pulls it off in this short but engaging book. Herman Wouk demonstrates that even in his 90's he's still an incredible story teller. The first sentence of the description reads "For more than 50 years, legendary author Herman Wouk has dreamed of writing a novel about the life of Moses." THIS IS NOT THAT NOVEL. It is a novel about making a movie on the subject. The description goes on to explain that; however, it is easy to focus on the opening sentence of the paragraph. The novel is not what I expected, but it would be unfair to base a review on that, so this review is based upon the actual novel, not my expectation. I've always enjoyed Wouk, especially Winds of War, War and Remembrance, and The Caine Mutiny. This is a very different style, and is a very short book in comparison to most other works. I moderately enjoyed the actual story, and the different style kept my attention. Was it worth my time in listening? Yes, as a short story. I don't think I could have handled a lengthy one in this style. It is short enough that its value (cost per listening hour) is questionable, but in retrospect I don't feel my credit was totally wasted (based upon the story itself). As for the performance? The male narrator is very good. The female narrator, however, is atrocious. She sounds like a bored seventh-grader doing a mandatory reading in class. Her intonation is that of valley girl, with a touch of gargled gravel at the end of each sentence. She is painful to hear. The shortness of this novel was a blessing that made it marginally tolerable. Overall, three stars. Check out the sample (I didn't, and don't know if her voice is sampled) and decide for yourself. Wouk fans will probably want to put a checkmark in the "read" box; for others, it's probably worth passing. Absolutely. It's creative, one of a kind, and fast paced. About movie-making, the behind-the-scenes process. The Moses story, although alluded to, which is just enough but not too much for non-religious readers, yet compellingly told by an intelligent assortment of creative types, all represented in the book via the emails, faxes, voice mails, letters, and other various & sundry modes of modern-day communication. A 21st century novel of letters, about Moses et al. The woman representing the screenwriter, her voice is much too young and, even more important, inexperienced in the ways of Hollywood, even to the extent as described by her character (which is not especially experienced). But there's an important tone that's missing from her voice, and it's about basic life experience. It's missing. For Moses' sake, let's give such a writer a Woman's voice, not a girl's, not even a grown up girl. It is a privilege to observe a little of the loving relationship between Herman Wouk and his wife, Betty Sarah Brown, in their life as writers. The story, although fictional, seems real-life and is quite funny and sweet. The book starts slowly and introduces the characters obliquely, then rapidly draws you in to learn what comes next. I loved this book. Herman Wouk is my favourite author. Period. I enjoyed every single one of his books. He has enriched my life and I am grateful to him. Now, at the age of 97 (!) he has done it again! The Lawgiver is a beautiful book, though certainly not as deep and monumental as for example "War and Rememberance". Nevertheless, Wouk writes with his legendary grace, wit and insight and this book was a pleasure to listen to. I am particularly fascinated by this one because it reveals a certain familiarity with religion and scripture that I find facinating. As mentioned male narrator is quite good, even sounds like Wouk but female narrator which is representing a character supposed to be a wunderkind with a Chassidic background sounds like a teenager talking to friends in a mall and steps on every Yiddish or Hebrew word in the script.